Shu Ruei is an emerging contemporary artist based in Kuala Lumpur, Malaysia. She apprenticed with Long Thien Shih (Malaysian veteran artist) in painting and draughtsmanship (2005 -2009), and later entered ASWARA (National Academy of Arts, Heritage and Culture), where she graduated with a Diploma in Fine Art (2009 -2013), majoring in printmaking. She is also a member of Studio TERUSI (a Malaysian artist collective), since doing her industrial training there in 2011, where she learned some basics of traditional Malay woodcarving. Educational exposure to traditional Malaysian heritage informs her work, primarily community art installations and mixed media collages that incorporate everyday Malaysian imagery. Her work has been exhibited in Pelitahati Gallery, G13 Gallery, and Map Publika amongst others in Kuala Lumpur and Penang. In 2011, she received a Rasa Alam Exhibition Special Jury Award from Universiti Kebangsaan Malaysia (National University of Malaysia), and a series of her linocut prints entered the art collection of ‘Rumah Malaysia’; the Malaysian Embassy in Brussels, before being shifted to 'Rumah Malaysia', Beijing. ​In October 2013, her ‘Orang Boxes’ installations were included in the SpotArt Young Artists Festival 2013; a Singapore Biennale 2013 fringe event showcasing emerging ASEAN artists who were jury selected from a regional open call. She was the only Malaysian artist selected. 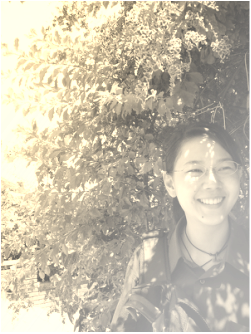 Since 2014, Shu Ruei has been invited to exhibit collages in ‘Thinking Drawing’ (a group exhibition of contemporary drawing), the 8th Art Expo Malaysia, and also to develop 3 new installation pieces: a community art project called ‘Fruit in Kind’ (re-installed 6 times), ‘Migration’ for The Langkawi Biennale 2014 and ‘Dunia (Turning)’ for the ‘Soya Cincau’ group exhibition (Core Design Gallery). In addition, she was again selected for the 2nd time to participate in the 2nd SpotArt Young Artist Festival, Singapore. 2016 saw her work exhibited in group shows by Richard Koh Fine Art (KL), Eti Archeology Museum Eskisehir (Turkey) and Poh-Chang Academy of Arts Gallery (Bangkok). This was followed in 2017 by 2 solo artist residencies, where she extended the solo artist exhibitions offered by each residency into 'collective exhibitions', that included and involved the participation of the local communities. The first artist residency was at Galerie d’Art de l’Apeka, Reunion Island, France, followed by the Regional Art Forum artist residency program at the University of San Carlos, Cebu, Philippines, with the exhibition hosted by 856G Gallery, Cebu. For 2018, Shu Ruei is currently a Rimbun Dahan residency artist for 6 months. She will be part of a 2 artist show hosted by Rimbun Dahan in mid January 2019.